Increasingly broad mobilisations by the Papuan people in recent years shows that there must be a new assessment of West Papuan as an entity. An entity that should be, must be, recognised as a nation. Resistance by the Papuan people existed prior to West Papua's integration into Indonesia in 1969, known as Pepera or the so-called "Act of Free Choice", and since that time. However what differentiates the resistance that is currently developing is the method of political mass mobilisations. The current political mass mobilisations are being led or initiated by youth groups such as the Papua Student Alliance (AMP), the West Papua National Committee (KNPB) and the Garda Papua (Papua Guard). And these youth groups have also greatly developed the understanding that the struggle for Papuan liberation cannot rely on "sympathy" or "international recognition", but must instead depend upon the determined efforts of people's unity and the Papuan nation for its liberation. In a number of mobilisations, this youth movement has supplanted the "older groups" that were part the armed resistance (the National Liberation Army or TPN and the Free Papua Movement or OPM) that were dividend and fragmented along with other older factions, whether they be part of the Papuan Presidium Council (PDP), the Papua Customary Council (DAP) and the like. In the same manner they have been able to sit together and unite under the United Liberation Movement for West Papua (ULMWP). Similar unity projects took place in 2005 although they did not last long. The ULMWP as a unity project is more organised compared with earlier attempts. While in the early years after 2000 the issue of divisions within the movement and the Papuan people between the "interior" and the "coastal" areas coloured the analysis and assessment of West Papua and its movements, in recent years this has become totally irrelevant. Meaning that the unity between Papuan people's groups has become increasingly solid, although attempts at dividing and playing off groups against each other by Jakarta have increased in frequency. Jakarta's policy of "Special Autonomy" is increasingly understood by the Papuan people as little more than a bribe and illusion. "Special Autonomy" has failed to deliver political freedom, let alone prosperity for the Papuan people. In many instances it has simply left behind school buildings that have no students or community healthcare centres without doctors. Economically, it has only benefited a handful of the elite through infrastructure projects, but failed to address human development as a whole. Ethnic differences arising from the more than 250 or so tribes that exit in West Papua or the lack of a "Papuan language" can no longer be used as grounds to claim that West Papua does not exist as a "nation". Or likewise the divisions of the Papuan people as a nation, because the development of the Papuan people's movement has demonstrated increasingly close and meaningful social and political bonds. Why? Of course what is most essential is the oppression of political freedoms (freedom of expression, freedom of association, freedom of speech, and freedom of thinking) along with the exploitation of natural resources by international companies (such as Freeport) that are affiliated with the Indonesian government and are destroying West Papua's environment. Not to mention the exploitation of the Papuan people who earn lower wages than non-Papuans. Or the share of profits from mining. International companies are "ransacking" Papua's huge natural wealth and human labour. Yet the tiny share of profits that remain in the country are then being "robbed" yet again by the Indonesian government. Let us look at how the entity of Papua has developed from an "embryo" to an increasingly solid nation. In the interests of stealing profits from the exploitation of Papua's natural resources, the Pepera was implemented through coercion and manipulation. Following this, those who demanded historical truth were repressed by the military. The interests of international corporations were opened up by the militarism of Suharto's New Order dictatorship through the destruction of the movement and the arrest of Ferry Awom in 1967, who along with others had declared the OPM two years earlier. Arnold Ap, a Papuan activist and artist in the cultural movement in 1984 was eventually arrested by Kopashanda (now Kopassus, the Army's Special Forces). Arnold Ap's body was found sprawled in the middle of the jungle in April 1994. This was then followed by killings in Enarotali, Obano, Moanemani and Wamena resulting in as many as 10,000 Papuan fleeing to Papua New Guinea (PNG) to seek safety in the years 1977-1978 and the early 1980s. A Military Operational Zone (DOM) came into force in West Papua between 1978 and October 5, 1998. In 1988 Dr. Thomas Wanggai, who declared Papua independent in 1988, died in detention at Cipinang prison in Jakarta in 1996. The case that still attracts political attention to this day is the Abepura case which resulted in the death of scores of people as well as the more recent bloody Paniai case. These cases do not yet include the shooting of other West Papuan pro-democracy activists, activists that have been jailed for years such as Filep Karma, and the murder of Mako Tabuni. Finally, the more than 1,000 Papuan activists, the majority of which are members of the KNPB, that have been arrested and jailed. Not to mention the murder of unidentified individuals who have been shot or run down by vehicles in the middle of the road. Rather than providing more democratic space, the government of President Joko "Jokowi" Widodo, through former Coordinating Political, Legal and Security Affairs Minister Luhut Panjaitan (who was recently replaced by former General Wiranto), has allowed an increase in the number of Regional Military Commands (Kodam) and issued discriminatory statements against the ordinary Papuan people. The massive economic exploitation of natural resources in West Papua is clearly visible. As is taking place in the forests of Wasior, illegal logging by the military and various companies is occurring on a massive scale resulting in the eviction of traditional communities. Protests by these traditional communities have ended in shootings and the death of six people. Not to mention the massive Freeport MacMoran mine, which is largely owned by the US, which began operations in the 1960s. The Freeport gold and copper mine actually receives tax benefits of between US$700-800 million and as much as US$1 billion annually. Not to mention the various tribes in Papua that have lost their land and livelihoods because of the Merauke Integrated Food and Energy Estate (MIFEE), as in the case of the Mahuze clan in Merauke. They have suffered brutal repression and the destruction of their environment which for them is the "Mother" of the Papuan nation. The Papuan People have experienced racial discrimination both in their own land as well as in other parts of Indonesia such as Manado, North Sulawesi and in the Central Java city of Yogyakarta, as in the recent case of Papuan students at the Papuan Student Dormitory in Kemasan, Yogyakarta. They also suffer racial discrimination in the workplace, both in government institutions and the private sector. As if this is not enough, the total number of Papuans is steadily declining. Data for the years 2013 and 2014 show that the number of indigenous Papuans was around 1.7 million while the number of non-Papuan migrants stood at 2 million. Data for 2015, up until May, shows the number of indigenous Papuans has declined to 1.5 million while non-Papuans have increased to 2.3 million. According to a statement by the AMP, the number of indigenous Papuans has declined by around 200,000 over just a few months. The decline in the number of indigenous Papuans is being caused by systematic and massive murder, an atmosphere of fear created by the Indonesian military resulting in migration to PNG, deaths due to HIV and AIDS, alcohol related health problems and child malnutrition. For the Papuan people, being part of Indonesia for almost 50 years has not brought happiness, but instead physical and psychological repression and the destruction of their "Mother". So what then is the meaning of being part of Indonesia? Increasingly it has no meaning. Increasingly they feel as if they are not part of Indonesia. And that means a growing sentiment for self-determination as an independent nation. The capitalist economic and political relations in Papua have integrated the Papuan people from various tribes and clans in the markets, schools and universities, hospitals and other places of association. Yet the militaristic repression, the destruction of the environment along with their organisational resistance has provided a material bases for West Papua's development as a nation. As defenders of democracy and human rights, recognising West Papua as a nation, supporting and giving solidarity to the right to self-determination through a referendum for the Papuan nation, is the way by which to free the Papuan people from the militaristic repression of the Indonesian government, so that the violence will end, so that there will be peace, freedom and prosperity in the land and nation of Papua. Because of this therefore, we call on our comrades, both as organisations and as individuals, to unite and take a stand in supporting the right to self-determination through a referendum for the Papuan people, to consolidate in building an Indonesian People's Solidarity movement for the Nation of West Papua. Hi Amo, yes, that is what the writer is implying, but also saying OT is Papuan peoples right to choose independence, their aspirations and processes need to be respected , and only West Papuans should make that decision. It’s is also saying that Indonesia’s conduct is responsible for West Papuan people wanting to be free from Indonesia, and Indonesian civil society would be sad to see West Papua go separately, but that they (Indonesians) must respect that choice. Again, this is commentary from an Indonesian civil society figure, and published to show the solidarity growing inside Indonesia for West Papuan Rights including self-determination. 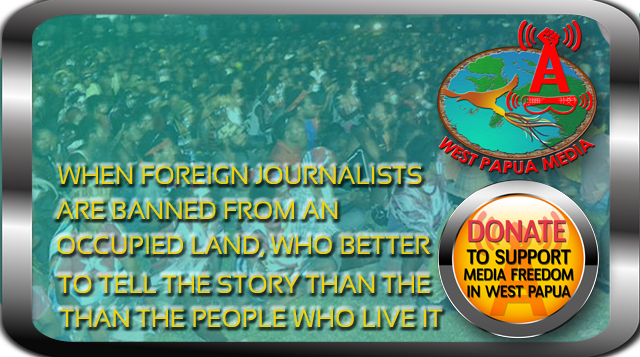 It isn’t by WestPapuaMedia, just syndicated to stimulate discussion.